Pastor Theophilus Roymichael Burrel was baptized in Jesus Name and filled with the gift of the Holy Ghost at age 9. He accepted and acknowledged his call to the ministry at age 10, and preached his first sermon, “The Love of God.” Pastor Burrel graduated from Muskegon Orchard View High School in 1979, where he was crowned, “The first Black home coming king” in the history of Orchard View schools. Pastor Burrel was ordained as a Licensed Elder in June 1982 at the National Convention of the Pentecostal Assemblies of the World. He was ordained under the leadership of Bishop L.E. Brisbin, Bishop R.P. Paddock, District Elder Harold Scott, and Secretary R.E. Lloyd. 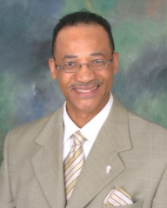 Pastor Burrel received an Associate Degree in Liberal Arts in December of 1985 from Muskegon Community College. He also obtained a Bachelor of Theology Degree in May of 1988 from United Bible College & Seminary of Orlando, Florida. He was elected as a State Evangelist by the Northern District Council in June of 1986, and served three consecutive terms. To his credit Pastor Burrel published his first book in 1999 entitled, “How Are The Dead Raised?” His book was sold at Muskegon Hages Christian book store, and Barns & Nobles book store. Pastor Burrel served faithfully under the leadership of his father, Bishop William Lee Burrel, and his brother, Suff. Bishop Willie Burrel. He was installed as Pastor of Apostolic Church of God-Muskegon in September of 2002, by the Northern District Council Chairman, Suff. Bishop Willie Burrel, under the leadership of our Diocesan Bishop, Harry L. Herman. In March of 2014 Pastor Burrel was elevated to the position of District Elder, by Diocesan Bishop Ira Combs Jr. Where he served under the leadership of Diocesan Bishop Moses Butler in the Dominican Republic, which is an International Missions Council. The consecration service was conducted by Diocesan Bishop Moses Butler and Suff. Bishop W.C. Reynolds on June 27, 2014. 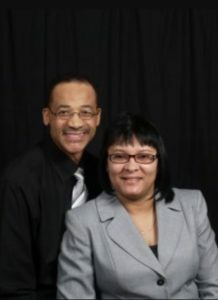 District Elder Burrel is now serving as a District Elder in the 12th District of the State of Michigan, which is the Fifth Episcopal District of the Pentecostal Assemblies of the World INC.
District Elder Burrel married his first love and childhood sweetheart, 1st Lady Lecia Burrel, on October 29, 1983. This year will mark 33 years of marriage. To this union five children were born; Elecia, Lemeia, Theo II, Stephanie, and William. District Elder Burrel previously worked for The Muskegon County Prosecutor’s office, The City of Muskegon, Whitehall Community Education, Muskegon Area AIDS Resource Services, Muskegon YFCA, Child & Family Services of Western Michigan, Muskegon West MI Therapy, Muskegon Habitat for Humanity, and as a Christian Counselor. Since 1990 District Elder Burrel has also been a licensed sports official for the state of Michigan High School Athletic Association (MHSAA). For the past 25 years District Elder Burrel has volunteered for the Muskegon Correctional Facility Religious Task Force. He also serves as an instructor for the Western Michigan Bible Institute, Inc. in Muskegon, Michigan.